FenwayNation—Red Sox, Mookie, J.D., Bogaerts, Sale, JBJ—Founded 1/27/2000—9-Time Champs: Clay, We Most Definitely Knew Ye—Wicked, Wicked Well! Clay, We Most Definitely Knew Ye—Wicked, Wicked Well! 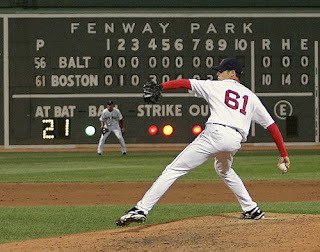 He was picked by the Red Sox in the first round of the 2005 draft—the 42nd pick overall. 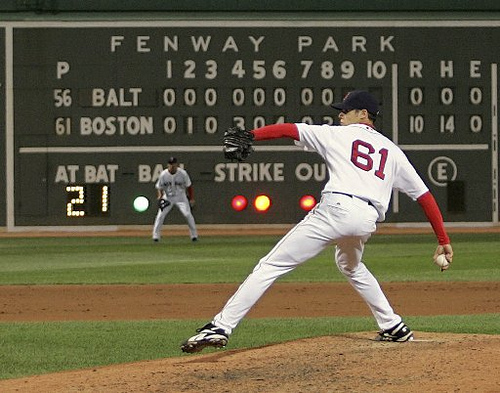 But almost from the first moment, there was controversy surrounding Clay Buchholz. Stories emerged about his possible involvement in purloined laptops at his Texas high school. But that was quickly forgotten as he made his MLB debut in the 2007 Championship season—just three days past his 23rd birthday. And, in just his third MLB start he pitched a no-hitter. The future was extremely bright for the tall Texas righty. But, then, he had sub-par seasons in 2008 and 2009—with injuries limiting him to just 15 and 16 starts, respectively. Doubts began to emerge, and Clay never really overcame those doubts. And yet, he had a huge bounce-back 2010 season—finishing sixth in the Cy Young voting with 17 wins and an All-Star berth. Then another All-Star season in 2013—but only 16 starts due to more injuries. His final three seasons in Boston were 'up and down' at best. In the post-season, he pitched well in the 2009 ALDS and the 2013 World Series—but overall, his playoff performances were as spotty as his regular season ones. That's probably what what we'll all remember—the potential, but also the injury-plagued disappointment. We wish him the best in Philly!